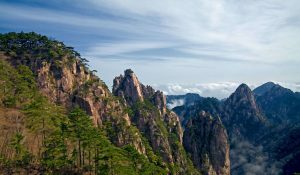 Huangshan city is composed of three districts, four counties and Huangshan Scenic Area, occupying nearly 3,800 square miles (9,807 square kilometers) and is home to 1.48 million people. Huangshan was called “Huizhou” in ancient times and was inhabited as early as 7,000 years ago. Huangshan City in Anhui province is endowed with breathtaking scenery, prodigious history and a culture all its own. With its unique charm, no matter what your preference is in your travel, Huangshan has something for you. 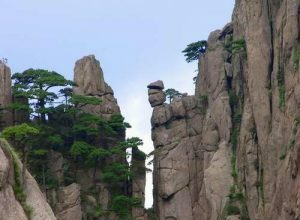 Huangshan Scenic Area is world-known for its four scenic features: legendary pines, picturesque rocks, hot spring and sea of clouds. Visitors would never be disappointed after a visit to these amazing sites. 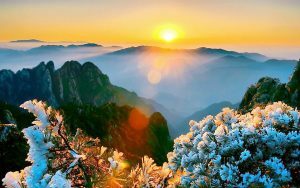 Sunrise in Huangshan is particular charming and marvelous and no Huangshan trip is perfect without seeing the sunrise on Huangshan Mountain. 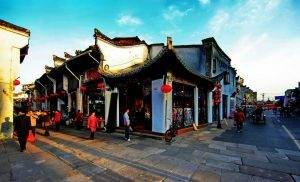 With a history of hundreds of years, Tunxi Old Street, reputedly one of the most famous cultural districts in China, is the best-preserved commercial streets built during the Ming and Qing dynasties. 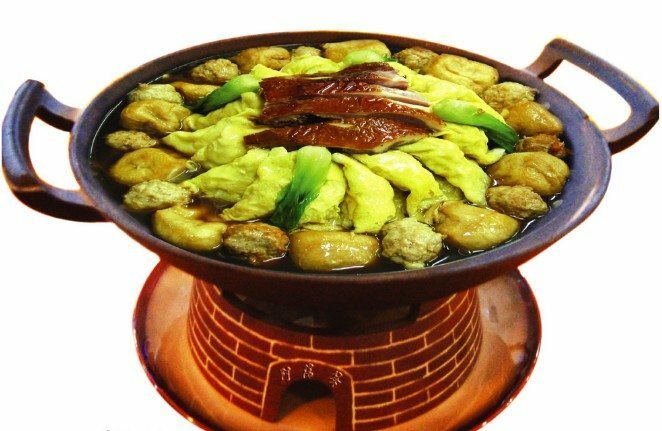 Anhui cuisine is one of eight cuisines in China, and among the numerous dishes in Anhui Province in Huangshan you can find, Mandarin Fish, Bamboo Shoots on Wenzheng Hill and Huizhou Fermented Tofu are indeed worth a try. 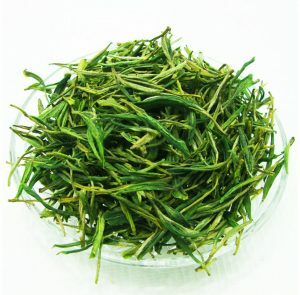 Huangshan Maofeng Tea is one of the most famous teas in China. Brewed in cups, the tea appears jade green and slightly yellow in color, pure in flavor and aromatic in scent. 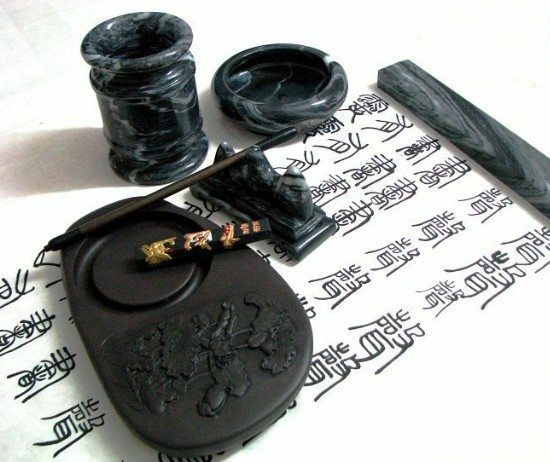 Anhui ink and Shexian Ink Stone is well-known around the world, and has been presented as gifts to foreign friends by Chinese leaders. Hongcun and Xidi are the sparkling pearls on your Huangshan trip. Both of them are brimming with authentic Anhui folk customs and traditional culture. The marvelous performance at Huizhou Theater is a great getaway to discover the real Huangshan. It introduces Huangshan culture by way of singing and dancing. Located in the subtropics, Huangshan’s climate is humid monsoon with four distinctive seasons. 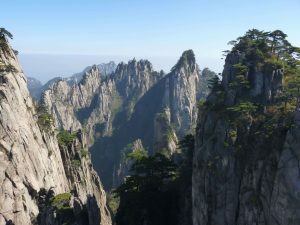 The average temperature in Huangshan is around 59 degrees Fahrenheit (15 degrees centigrade) in a year, which makes for a favorable Huangshan climate, neither too cold in winter nor too hot in summer. The annual precipitation is 1670 mm in Huangshan, with a maximum of 2708 mm. From May to August, it rains most in Huangshan. 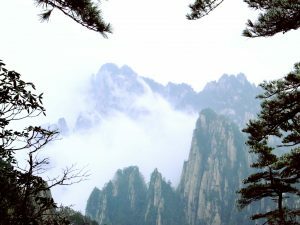 Huangshan’s climate is distinctive in each of the four seasons. In spring, the flowers are in full blossom and birds flutter freely among the rocky peaks. In summer, the city is an ideal summer resort, where verdant pines, mysterious seas of clouds, and cascading waterfalls have much to offer. It is the best time to view lush pines, picturesque rocks, red maple, yellow chrysanthemum and other natural scenes in Huangshan. If you come in winter, you would be rewarded with the delicate frost in Huangshan. 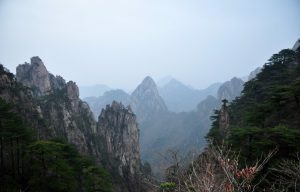 It is generally agreed that the best time to visit Huangshan is from April to November. 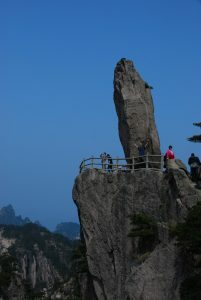 During this period, Huangshan has the most charming scenery to offer visitors. 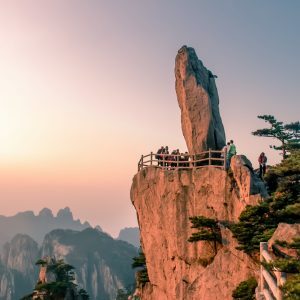 Among the numerous Huangshan attractions to see, Huang Mountain is the most well-known, which is renowned for its four scenic features: the legendary pines, picturesque rocks, the sea of clouds and its hot springs, living up to the reputation of “the most fantastic mountain under heaven”. What is more, the ancient Hongcun Village, Xidi Village and Tangyue Memorial Archway also captivate the many tourists who pay a visit. Ready to see the wonders of China for yourself? Give us a call at (888) 878-1777 or fill out a simple form today to get started! Huangshan Mountain is one of the ten celebrated scenic spots in China and the only one in the mountainous regions. Bearing many natural wonders, Mt. 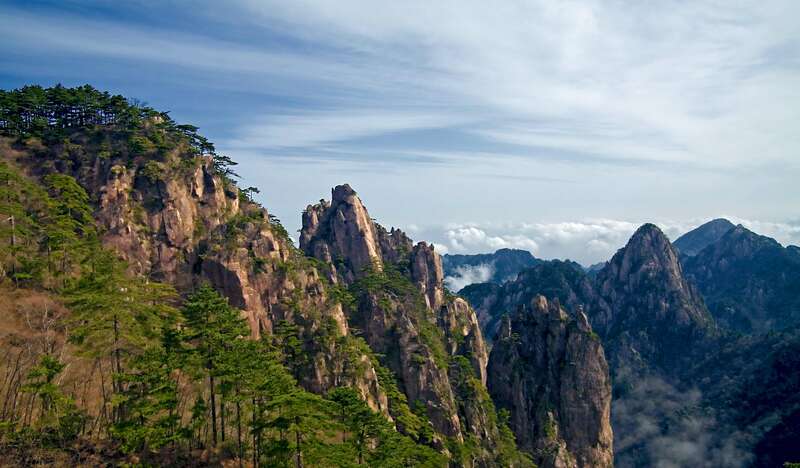 Huangshan boasts all the charms of the notable mountains of China. 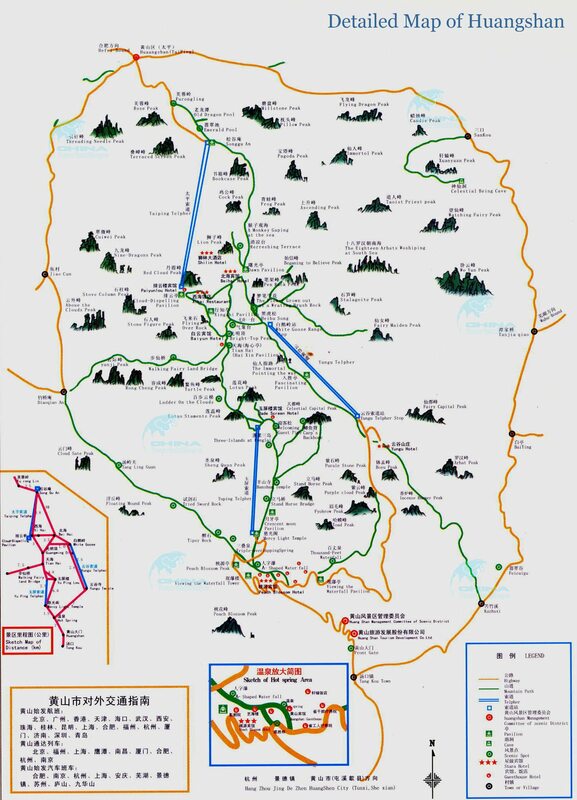 Also, we are going to visit the local villages around Huangshan area to experience the traditional culture. 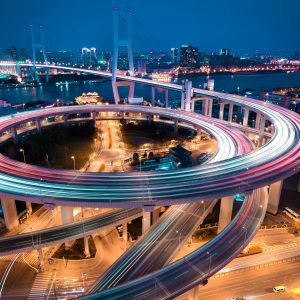 Explore the biggest city in China: Shanghai. Enjoy the historical attractions and modern city views. 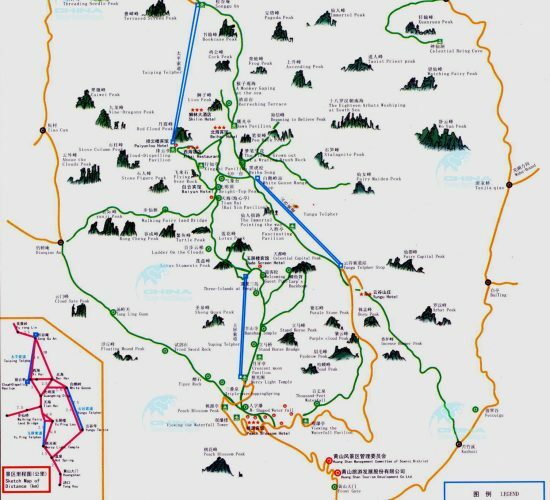 You will also go to visit the famous Mt. Huangshan, which is undoubtedly China’s most celebrated mountain for its grandeur and beauty. Mt. 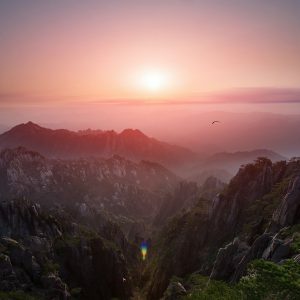 Huangshan is undoubtedly China’s most celebrated mountain for all its grandeur and beauty. We will take the round trip cable car to visit Mt. Huangshan to appreciate the breathtaking scenery. 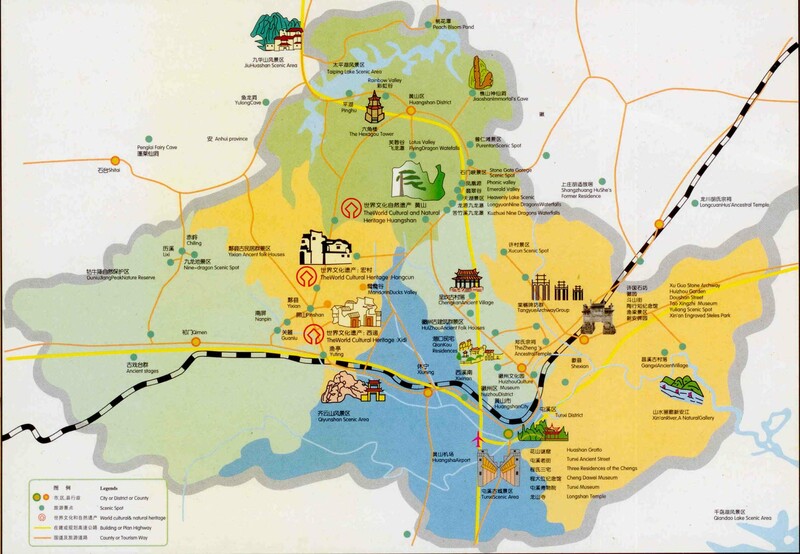 Then we will visit some of the beautiful local counties as well. 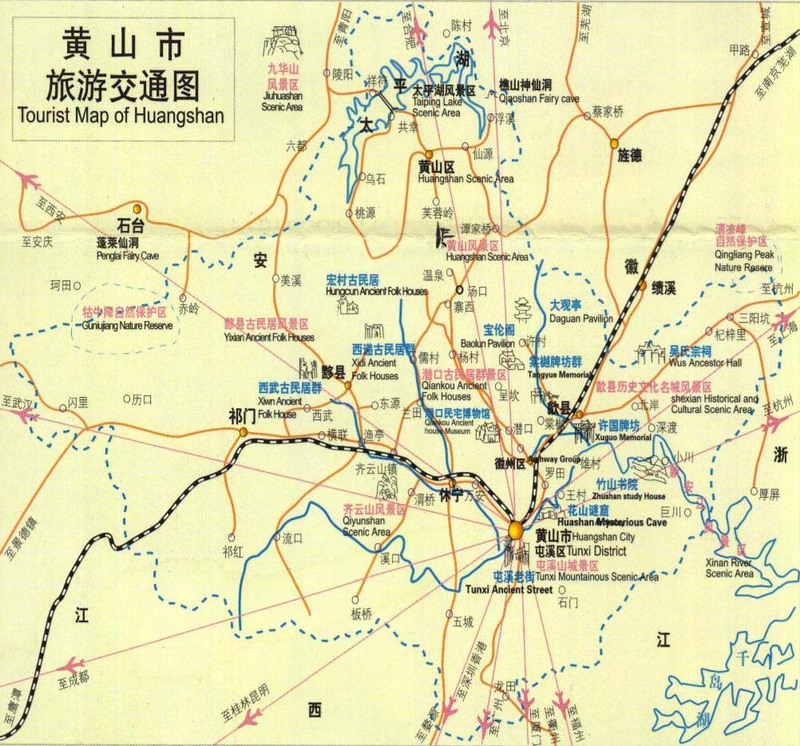 In 1987, Huizhou was renamed Huangshan City. 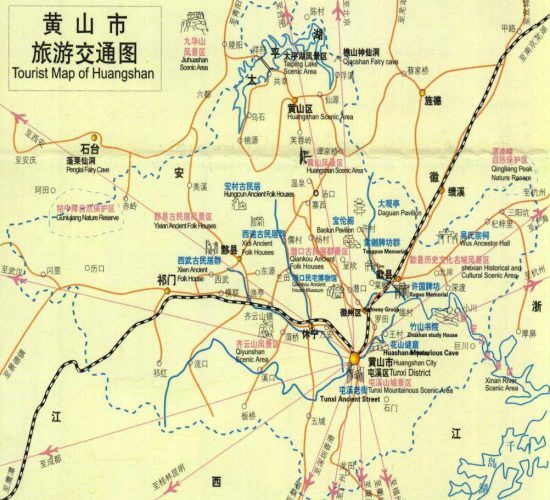 Therefore, no Huangshan overview is complete without mentioning Huizhou. 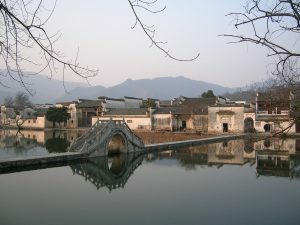 Huizhou has a long history and can be dated back to 2,200 years ago. 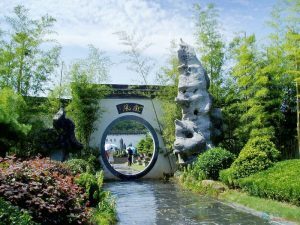 Huizhou’s culture includes nearly every aspects of society, ranging from the philosophical, economic, historic and scientific, which has had a great impact on the development of Chinese culture as a whole. Based on the tune-patterns of Yiyang and Qinqiang, Hui opera developed its own characteristics under the Ming and Qing dynasties. In the middle of the Qing dynasty, it has developed into a terrific opera style, integrating singing, dialogue, acting and acrobatics together. 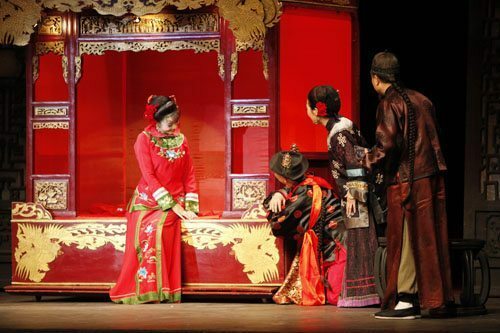 Hui opera climaxed after being brought into Beijing by the famous “Four Anhui Opera Troupes”. 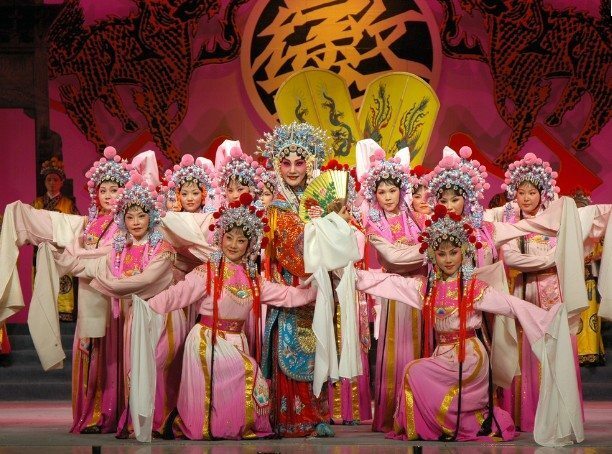 Combined with Hui opera and Han opera, Beijing opera was born during the reign of Daoguang Emperor. At that time, there were 47 Hui opera troupes and 180 actors in Beijing. Huangshan is known as the “hometown of tea”. 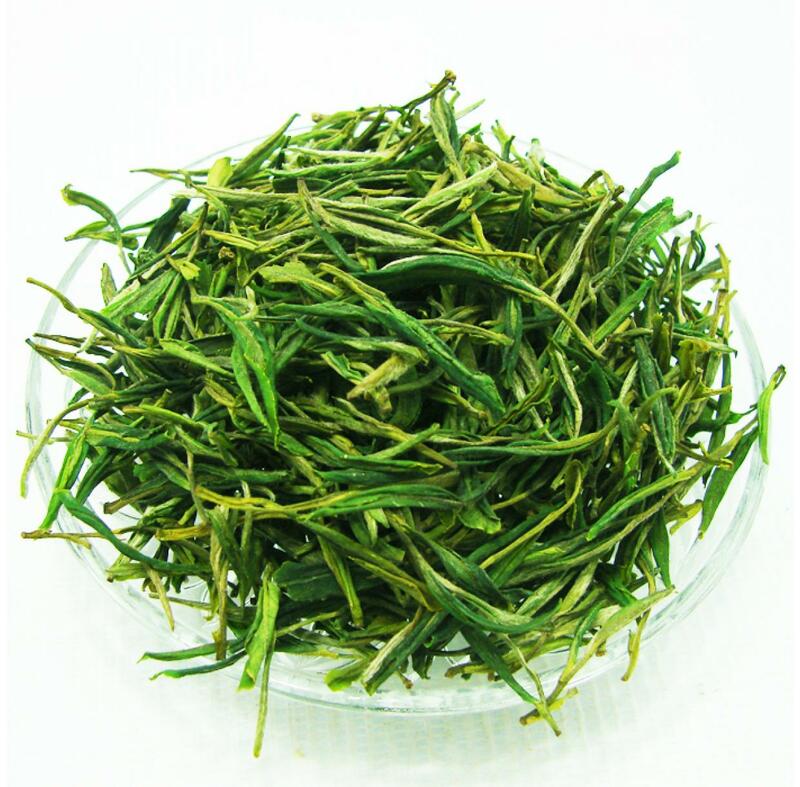 Such renowned green teas as Huangshan Maofeng, Taiping Houkui, and Keemun Black Tea are highly-regarded within China and abroad. People in modern society are quite busy and hardly have time to taste tea with leisure. However, it is not impossible for them to do so. Squeeze a little time, invite several friends, make a pot of tea and select a tranquil place to appreciate the natural flavor of Huangshan tea while drinking, which not only relieves tiredness but refreshes spirit. 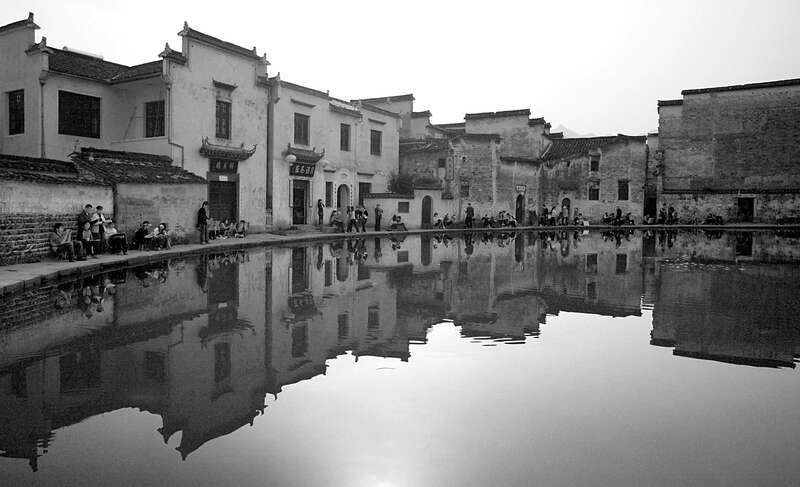 The architecture of Huizhou is a seamless amalgam of its breathtaking scenery and profound folk customs. 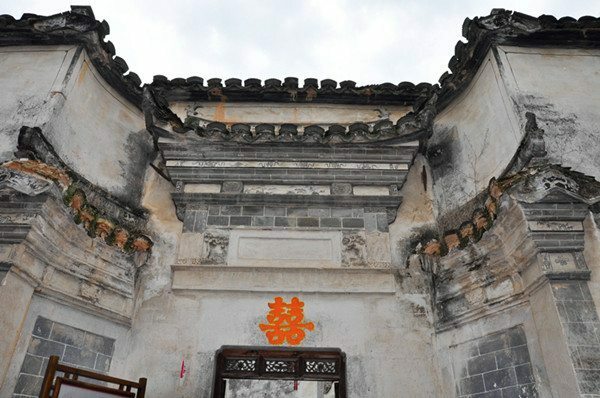 Art of engraving on Huizhou architecture is full of distinct local flavor, either in planning villages and towns or utilizing planes and dimensional room, which is particularly true of dwellings, ancestral temples and the memorial archway, “the three architectural features of Huizhou”. Lifted court, a kind of traditional folk art, is prevalent in the Xiuning and Tunxi regions of Huangshan City. The lifted court is three-storied, on which children are dressed up as heroes in stories and fastened, with its chassis lifted by four strong men. The lifted court is decorated with multi-colored paper-made lanterns shaped into a dragon, phoenix, crane, auspicious clouds, and the like. At the parade, these colorful lanterns are lit up and the children under the radiance of light are just like fairies if seen at a distance. Accompanied by the thumping drums, the spectacle is quite striking despite the soundless actors on the court. 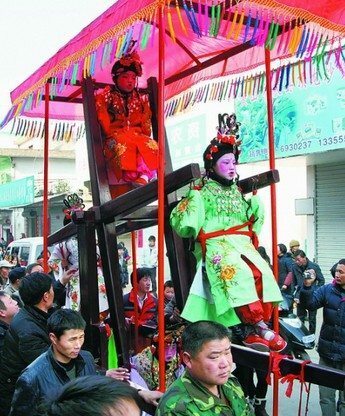 At present, the lifted court parades could also be seen on the street in Tunxi district. Huangshan food is quite representative of Anhui Cuisine, which is one of the Eight Cuisines of China. Cooking techniques of Huangshan food are characterized by broiling and stewing, which is usually seasoned with sausage and sweetened with crystal sugar. Special attention is paid to taste, color and appearance in Huangshan food, which is slightly spicy and normally salty. 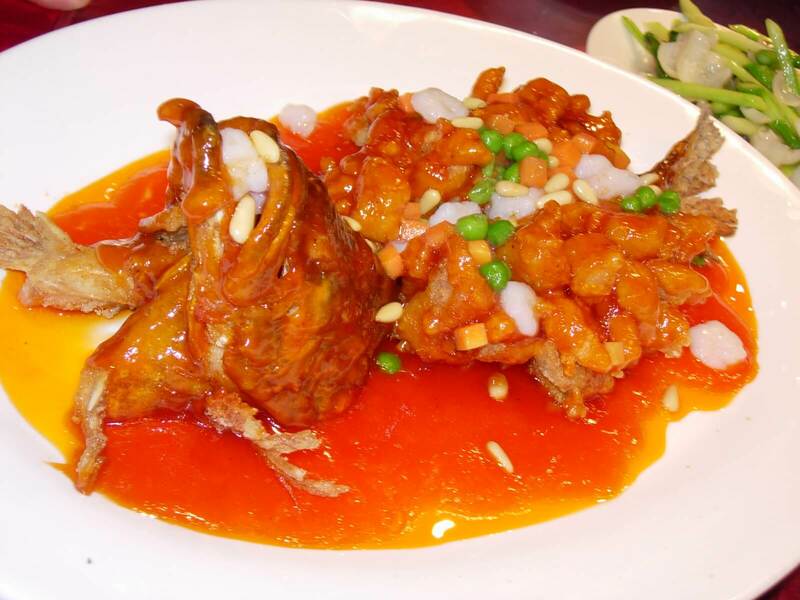 Mandarin Fish is a common dish in Anhui cuisine, which is offered with the mandarin fish native to the Xin’an River. The smell is usually strong, but the taste is appreciated by many who try it. After salted for seven days, the fish is fried in oil and braised with lettuce. With the unique cooking techniques, meat and bone are separated when the dish is made. 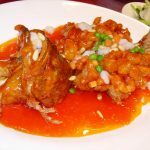 The dish not only maintains the original flavor of mandarin fish, but is seasoned with special ingredients, which endows it with an appetizing flavor. Bamboo Shoots on Wenzheng Hill, another popular dish of Anhui cuisine, is stewed with sugar, which is known for its color and fragrance. The main ingredients of this mouth-watering dish are sliced bamboo shoots, dried mushrooms as well as sliced sausage. Seasoned with sesame oil and other seasonings, the bamboo shoots are tender, crisp, fresh, and delicious. 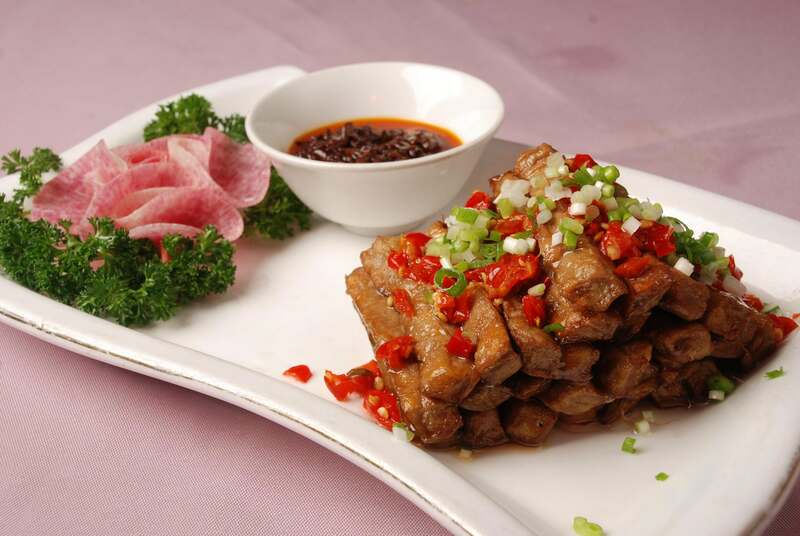 Fermented Tofu is the most typical dish in Anhui cuisine and no Huangshan trip is complete without enjoying it. After the tofu is specially fermented, on its surface grows layers of a white hair-like substance. After fried, the tofu appears golden and striated. 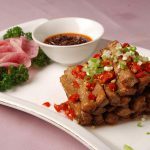 Seasoned with pepper jam and other spices, the tofu tastes fresh, palatable and fragrant. Chukar is a kind of peculiar chicken living in mountain creeks, which is the main ingredient in Steamed Chukar Chicken. Cooked with mushrooms growing in the local mountains, the streamed chicken tastes particularly fresh and tender. 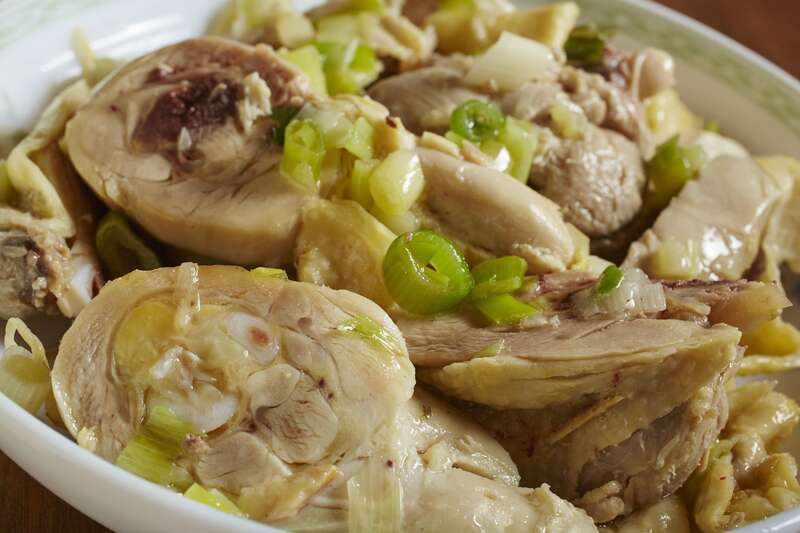 Since it is steamed under the cover of pot, the original flavor of chicken is maintained. 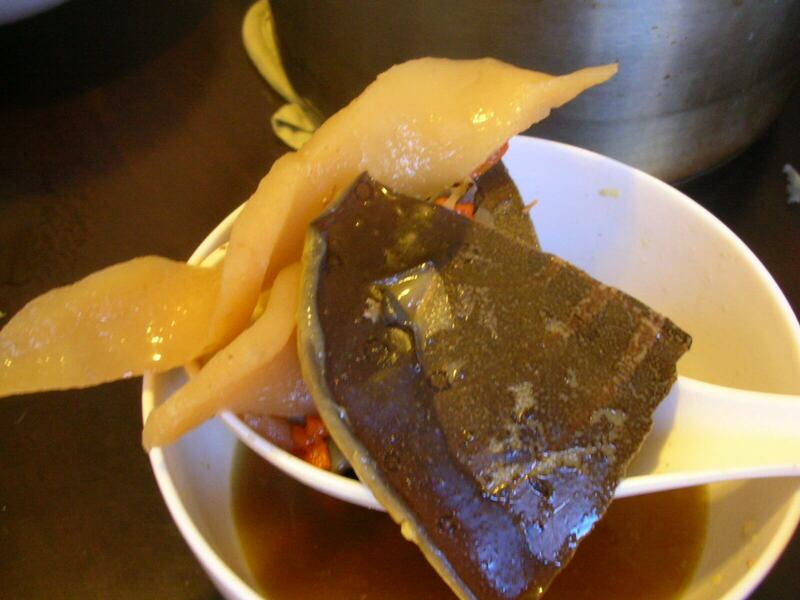 Stewed Turtle in Clear Soup is another famous and traditional dish in Anhui Cuisine. 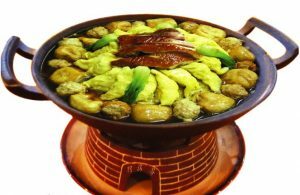 As its name suggests, the main ingredients in this dish is soft-shelled turtle, which is found in the mountainous area around Huangshan. Turtle, fresh sausage, crystal sugar, sliced ginger, cooking wine and other ingredient are also needed in this dish. 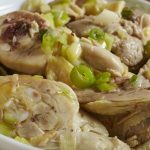 With turtle stewed with sausage, the turtle meat is mingled with the flavors of the sausage, making the soup thick and fragrant. Located at the eastern entrance of Tunxi Old Street, the First Restaurant on Ancient Street is a landmark; a must-have when visiting ancient street. This restaurant takes Anhui cuisine as its specialty and is decorated in antique style, which steals the attention of many visitors. Dishes in the restaurant are distinctive in features and reasonably priced. Specialties vary from fermented Tofu, braised mandarin fish to auspicious chicken and the likes. Neighboring The First Restaurant on ancient street, Home of Gastronomists located at the entrance of Ancient Street is another must-have for your Huangshan trip. This restaurant boast an elegant atmosphere and outstanding quality, and cooks up hundreds of home-made Anhui meals and snacks. No Huangshan trip is complete without enjoying the appetizing dishes made in this restaurant. Hometown of Anhui Merchants is another establishment specializing in Anhui cuisine in Huanghshan. The restaurant is decorated grandly, brimming with unique Auhui architectural elements. What makes this restaurant distinctive is the stage set in the magnificent hall, so that visitors can appreciate marvelous performance while enjoying palatable food. 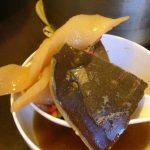 The dried bean curd, dried bamboo shoot, egg dumplings and salt-preserved meat are especially worth trying. Leaning on Tunxi Old Street, the Restaurant at Entrance of Ancient Street faces the Xin’an River, which is decorated in the Anhui architectural style, classical and elegant in atmosphere. Sitting at the window, guests can explore the mesmerizing cityscape of Huangshan while tasting the delicious entrees. Facing the bustling street, Teahouse of Wisteria is a great retreat from the big city for visitors. No visitors here fail to be overwhelmed by its unique garden-styled layout. Each tea seat is partitioned off from others by flower-carved windows and bamboo-made curtain. Teahouse of Wisteria is not only known for its desserts and beverages, but also for its unique Anhui dishes. Called Huizhou in ancient times, Huangshan, has much to offer for shopping-lovers as well. Handicrafts and healthy-boosting native products can easily be found here. As an old Chinese saying goes, where there are famous mountains, there are magic herbs. The world-famous Huangshan Maofeng Tea, one of the most famous teas in China, is grown on the mysterious Huangshan Mountain. The tea leaf is slightly curly in appearance, which looks like the tongue of sparrow in shape. 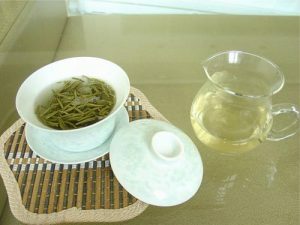 Brewed in cups, the tea appears jade green and slightly yellow. The best tea is picked in the early spring before China’s Qingming Festival. 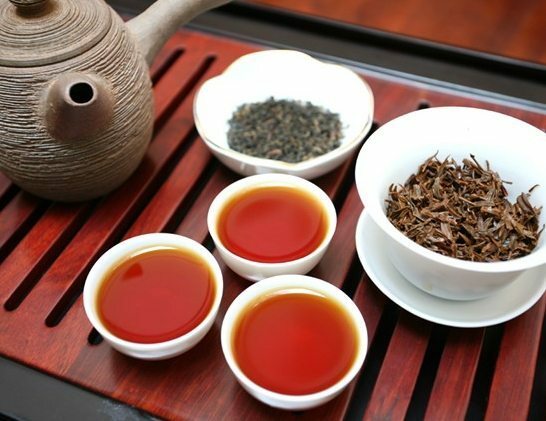 Therefore, if your Huangshan trip takes place in spring, you should never miss out on buying some fresh teas since they will be fresh and reasonably-priced at that time. 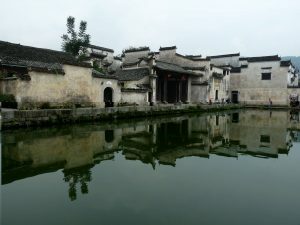 Since Anhui Ink is produced in Anhui Province, it is named Anhui Ink. 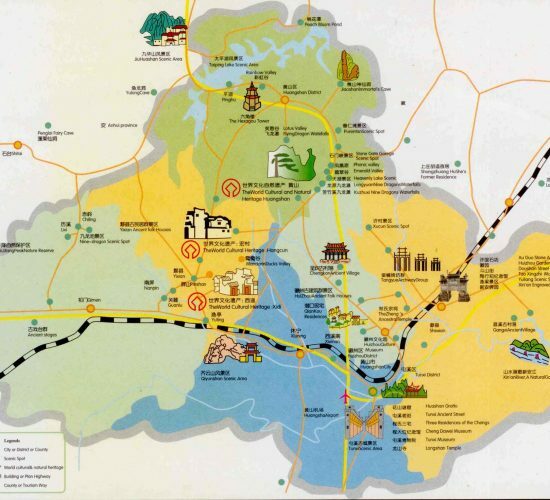 Jixi County, Tunxi District and Shexian County are the main ink-producing centers in Anhui. It is particularly preferred by men of letters in China. As an old saying went among the ancient Chinese, people with good ink could draw as well as Maliang, a prestigious painter with a magic brush in Chinese mythology. In modern times, the four treasures are not much-needed as before because of the predominance of the computer. Therefore, it’s a good idea to buy some traditional ink as a souvenir for your Huangshan trip. Anhui Ink are easily available on Tunxi Old Street and Yanxi Street in Tangkou Town. 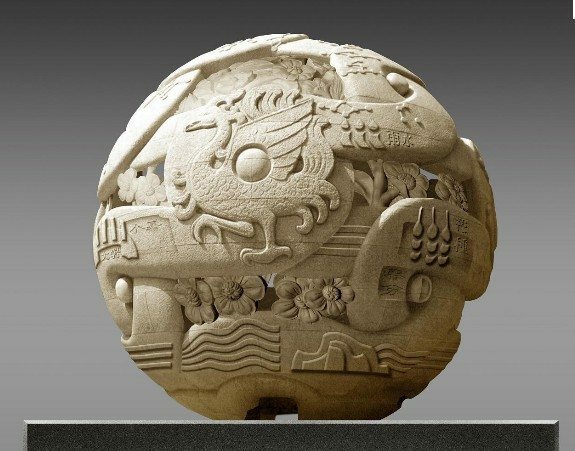 Shexian Inkstone, also called Longwei Inkstone, is one of the four well-known inkstones in China, which is carved from a special stone on Longwei Mountain in Shexian County. Inkstone is a stone stand used for preparing ink used in Chinese brush calligraphy. 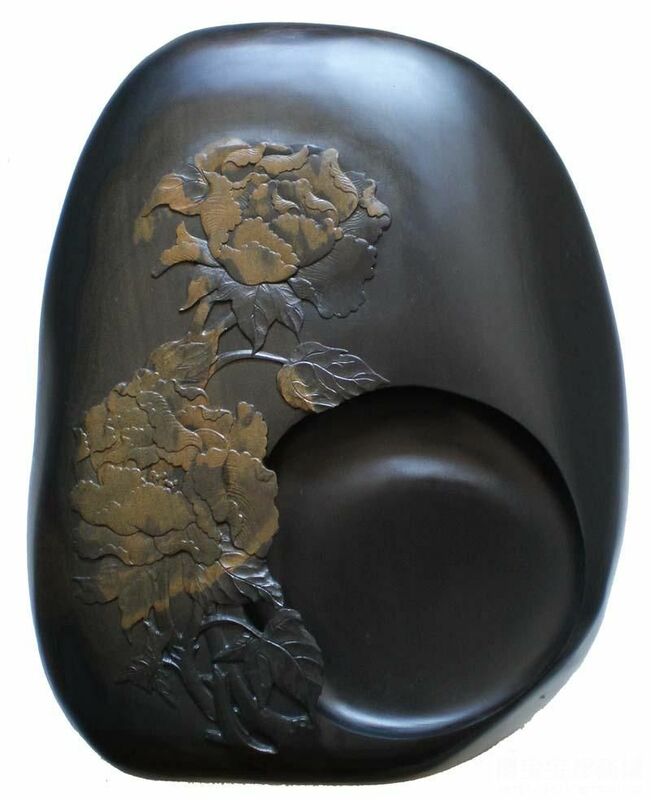 Shexian Inkstone is made in diversified shapes, varying from cobble, crouching silkworms to willow leaves. The inkstone-carvers usually take advantage of the original shape of the stone to show its natural beauty. The most renowned Shexian Inkstone is Jinxing Inkstone: it is high in durability and easy to wash. Shexian Inkstone has been presented as a gift to foreign dignitaries by Chinese leaders for many years. Carvings of Anhui are well-known since ancient times in China. 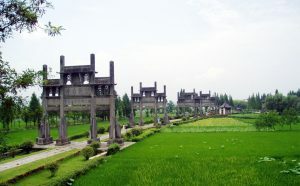 The Four Anhui Carvings refers to brick-carving, timber-carving, stone-carving and bamboo-carving. Carvings in Anhui are applied as decoration for architectures like dwelling, ancestral hall, temple and garden. Such handicrafts as furniture, pen container and fruit plate are decorated with the four carvings as well. Anhui carving began during the Song Dynasty and prospered during the Qing dynasty. Anhui carving is highlighted by the sophisticated hollowing-out skills of carvers, who inscribed lifelike images of trees, mountains, pavilions, people, bird and animals in a picture. 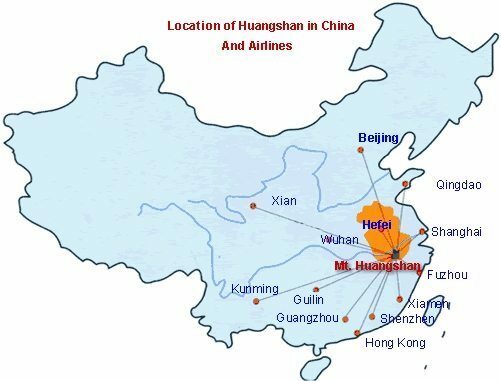 Since counties and towns in Huangshan City are not large enough, big shopping streets and malls are unavailable in these areas. As for downtown of Huangshan, there are some bustling streets available for shoppers, such as Tunxi Old Street, Trade Mart and New Street and the likes. 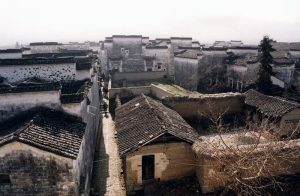 However, Tunxi Old Street is the most practical for visitors, where the traditional folk flavor of Anhui people can be felt.